Following the Berlin premiere, Hailee Steinfeld jetted off to London to continue promoting her new film 'Bumblebee'. She attended the photocall yesterday(December 5th) at Potters Field Park. Joining the long list of women who have embraced the huge power suit trend, Hailee took on the look courtesy of ZEYNEP ARCAY. 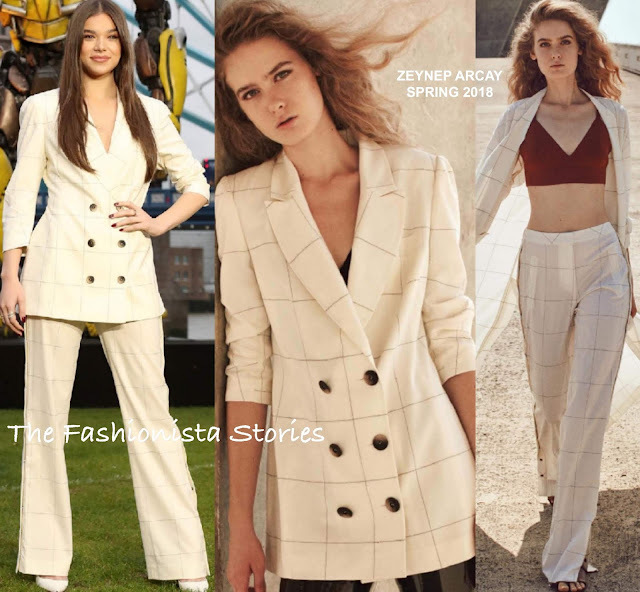 Her SPRING 2018 ivory plaid suit featured a double breasted jacket and side snap pants. The side snaps adds a sporty vibe to her overall suit look which she teamed with white pumps. She capped off her look with center part straight tresses and a shiny pink lip.